The $30 of your ACFA dues that is credited toward the Armory fee covers all routine cleaning and maintenance on your weapons and body cords. This covers the cost of minor parts like screws, springs and tips. It is your responsibility to maintain your equipment in peak competitive condition. 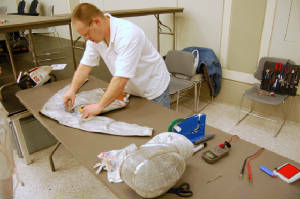 Our Armorer, Will Willis opens the Armory almost every Thursday at the salle from 7:00 to 10:00 p.m. Please bring him anything you want serviced as early in the evening as possible. The armory fee does not cover broken blades, bell, guard, or socket replacements, bodycord parts or blade rewiring. The Armorer can help you pick out a replacement blade if needed, but please order blades which are pre-wired with German tips. He can generally rebuild a wepon on the same night that you bring the new blade. Bell guards need to be replaced when they become so dented and damaged that they become unsafe. Deep dents can catch and break your opponent's tip, causing you a potential injury. If an Armorer, Coach, or Strip Director tells you to replace your bell guard, please respect their judgment. Guards cost between $10 and $20 and are cheaper than a trip to the emergency room. Generally, sockets will only need replacement if you change connector styles. Blades need rewiring if the wire breaks or the insulator cap inside the point breaks. This takes about one week and is an extra cost. All rewiring fees must be paid before you can pick up your weapons. Please remember to bring your money if you expect to pick up repaired weapons. 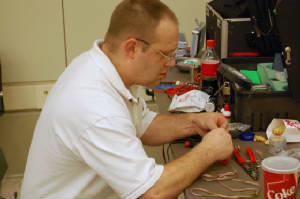 Many simple repairs are covered by your annual Armory Fee of $30. These may include taping, replacement of screws, springs or even a new tip; unless you are one of those fencers who destroy tips on a regular basis. Your fee also helps to insure that an armorer is available to check out your weapons during the practices immediately before a tournament. Please do not rely on the armorer to handle simple things that you can do yourself unless he is not busy. Take the time to learn how to service your own weapons. Will Willis is willing to help you learn. Ask him to teach you. These are estimated charges only. All prices are subject to change by the Armorer doing the work. For replacing damaged barrel or changing to German point. To repair broken wire, using your old German point. To repair broken wire, using your old french point. For replacing damaged barrel or changing point. Other parts and repairs are also available. Blades, Complete Weapons and Body Cords are available by special order. Will Willis is usually available at the Fencing Salle on Thursdays from 7:00 pm to 10:00 pm. Mathew Gasparovich is usually available at the salle whenever his children are in class (which is just about 100 percent of the time the Fencing Salle is open). Questions about Armory work or charges should be directed to Will Willis or Mathew Gasparovich.